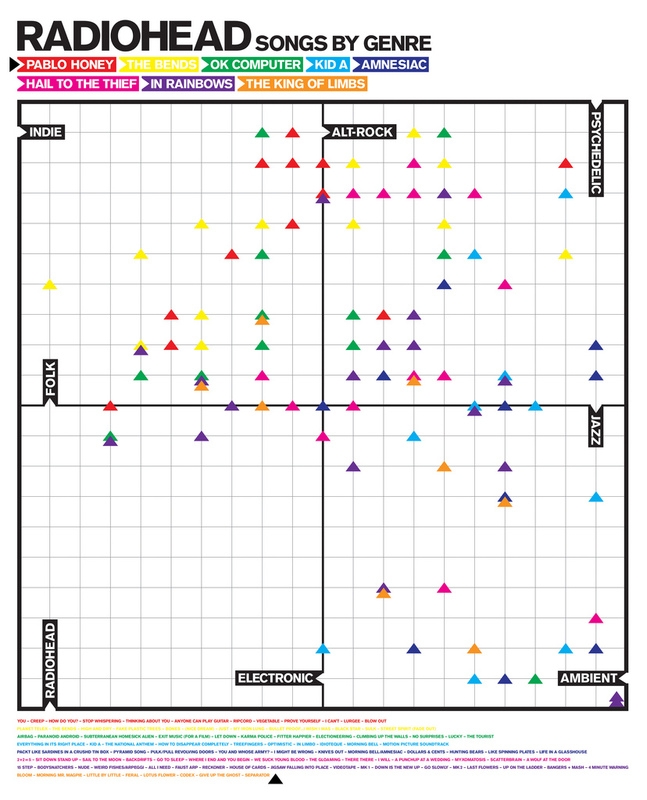 Radiohead is a band that is the very definition of “unclassifiable” I developed this idea of bleeding genres into each other and plotting the corresponding songs on a graph. It was by no means a mathematical undertaking and took several hours of quite enjoyable listening and debate to achieve. What you come away with is the basic idea that Radiohead in itself is its own genre, refusing to fit anywhere but inside itself. I am aware that this graph will come under scrutiny and be the brunt of harsh remarks, but in a way, that is what it is meant to do. It is meant to be discussed. It is an ongoing work in progress and until Radiohead stops making music it will never be finished. If you have any suggestions, remarks or thoughts on improving or altering this design I am completely open to them. After a few more revisions I plan on trying to get some of these made. They will be approximately 30X30 Inch silk screens. Many thanks to my friend Art Commisso for the help. You can view a larger version here. You can download an even larger version here. You can view the info-graphic up close by checking out Jamie’s site or clicking the two links above. 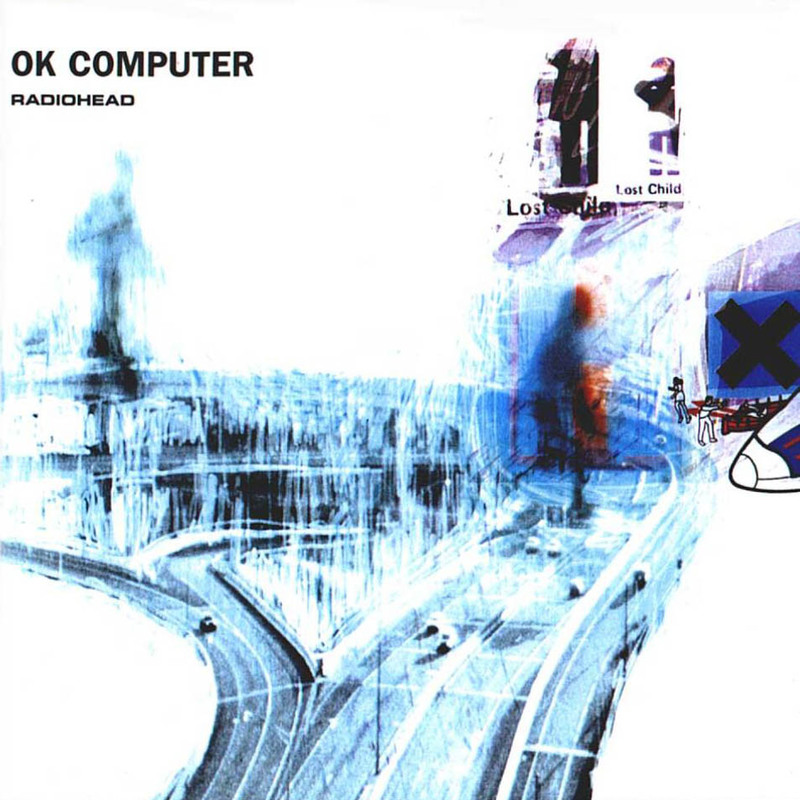 Q Magazine readers recently voted Radiohead’s OK Computer as the best album of the past 25 years. No big surprise there, right? The band also took three other places in the top 30 – compiled to mark 25 years of the magazine – with The Bends at eight, Kid A at 18 and In Rainbows at 23. 13 years ago, Q Magazine had a similar poll where OK Computer was also named best album of all time. Now that is staying power. Today all of Radiohead’s albums have been made available to purchase on iTunes. Not only that, but they are available as “iTunes Plus” (read: no DRM). We’re sure the addition of Radiohead’s album catalog has everything to do with EMI’s release of “The Best of Radiohead” compilation, which is also available through iTunes today. But wait! It appears that all of Radiohead’s music videos are available too. Make sure to check out the “Anyone Can Play Guitar” video if you’ve never seen it. So cringe-worthy, it’s great. I mean, who doesn’t love Phil and Ed dressing like bank robbers and Colin holding iguanas? C’mon! If the first half of the Nineties was shaped by Nirvana, the template for the second half was set by Radiohead. Though the 1993 smash “Creep,” from their debut, is itself indebted to Kurt Cobain, The Bends, their second album, is less angsty and more operatic, marrying a majestic and somber guitar sound to the virtuosic urgency of Thom Yorke’s vocals. Not yet shying away from guitar anthems, Radiohead draw on the grandeur of U2 and the melancholy of the Smiths and Jeff Buckley. “Fake Plastic Trees” was a radio hit, an introspective acoustic ballad of alienation. But elsewhere, the guitars roar and hiss, establishing Radiohead as the band to beat. Just when they seemed destined to become the next U2, Radiohead made this fractured, twitchy record. Despite esoteric nods to glitchy electronica (“Idioteque”) and free jazz (an eight-horn pileup in “The National Anthem”), they morphed those sounds into a surprisingly accessible elegy to tenderness — and had a hit anyway. John Mayer covered Thom Yorke’s “The Eraser” in a live performance recently. Now this isn’t the first time Mayer has showed his love for Thom and Radiohead… He covered “Kid A” once which actually sounded pretty good. Check it out if you’re bored like us.